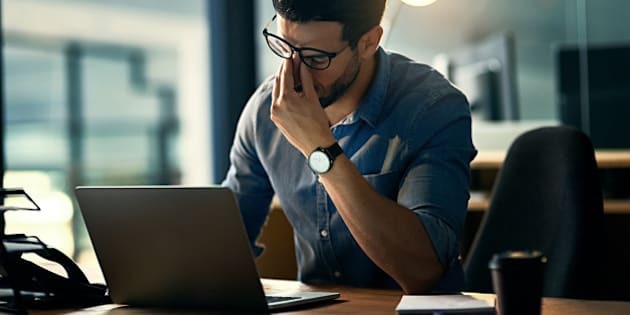 Tired eyes, blurry vision, neck pain and headaches are all symptoms of our technology-obsessed reality and goes by the acronym DES: digital eye strain, also known as ocular fatigue. If you live in North America, chances are that you spend every waking hour staring into a screen. You send a flurry of emails and send important text messages on your commute home. While you may see nothing wrong with this lifestyle, your body may be crying out for help. The condition occurs when you sit in front of a computer, tablet and phone for long periods of time. If you wear glasses, the strain may increase depending on the type of lenses you have. Unfortunately, working on screens is often an inescapable reality, but there are tips and tricks you can implement to minimize the effects of DES. Here are just some, presented in partnership with Varilux. Eye-glass wearers, this one is for you! 1) Place your computer screen at arm's length. It should be angled 20 degrees downwards in relation to your eyes. 2) Adjust colours and contrasts according to your vision. Your screen's brightness should be adjusted according to your surroundings. 3) Eliminate all screen glare by positioning your screen perpendicular to all light sources, including your windows. 4) Clean your screen. Removing fingerprints and dust that can improve the clarity of the image. 6) Remember to blink your eyes. It sounds simple, but it’s important. Task-specific lenses like Varilux Digitime offsets DES by quickly adapting to the screen in front of you. That means your eyes won’t have to strain as hard. The new lens has a magnified vision zone and a large field of vision which allows you to view your screens with ease.